John Leary, a sometime partner of Yesler, was one of a group of local movers who first attempted in 1881 to build and organize an integrated distribution system. The Spring Hill Water Company diverted spring water into a dozen or so wooden tanks along the ridge between First and Beacon hills and laid some sizable water mains beneath the business district's principle streets. However, the most auspicious moment for the future of community water in 1881 was the September 25 arrival of Reginald H. Thomson. At daybreak the young teacher stepped from the steamer Dakota onto Yesler's Wharf and was greeted by Yesler himself. Besides his baggage, Thomson carried ashore a predisposition to public service and a fervent belief in the importance of fresh water. "Clean water and sufficient water is the life blood of a city," he liked to say. "My father drilled that into me." In the year Thomson came to Seattle his cousin and host, city engineer F. H. Whitworth, advised the city council that the Cedar River was the best potential source for an abundant supply of pure community water. However, in 1881 the council's interest in building a water utility was as remote as the recommended river which flowed from Cedar Lake some thirty-five miles southeast of the city. The council chose to rely on Spring Hill instead. But the company's Lake Washington plant (now the site of Colman Park), which began pumping lake water to its new Beacon Hill reservoirs in 1886 could not keep up with the city's requirements. Its delivery was also less than heroic on June 6, 1889, the day thirty blocks of the business district burned to the ground. For the price of $352,265.67 the city purchased Spring Hill's system and the responsibility of supply its 12,000 customers. The remainder of Seattle's 42,000 citizens were serviced either from their own wells or by smaller water companies which the city utility eventually subsumed. Shortly after the fire destroyed most of downtown in 1889, Seattle Mayor Robert Moran hired Chicago waterworks engineer Benezette Williams to devise a plan for increasing the city's water supply. Williams warned against relying on the pumps t Lake Washington. Not only was the supply inadequate but the lake was already showing signs of pollution. The new municipal utility installed another pump at Lake Washington anyway, but as soon as R. H. Thomson became city engineer, on June 1, 1892 he forbade expansion of the Lake Washington plant and put his formidable will to the task of bringing Cedar River water to the city. During the summers of 1893 and 1894 Thomson and an assistant made several trips on the night train to Maple Valley. There they unrolled their beds in the woods and rose with the light to tramp along the line of Benezette William's proposed gravity line. Persuaded that William's plan for an open V-shaped flume was "very bad engineering" as well as unsafe and unsanitary, they rough-sketched a route for a buried pipeline. However, Thomson's plans were soon buried by the hard times of the Panic of 1893. two years later, funding problems were resolved after the state Supreme Court approved the city of Spokane's proposal to rebuild its water system with revenue bonds redeemed solely through water utility receipts and not from the city general fund. Using the Spokane model, Thomson and his assistant, George Cotterill, wrote and ordinance for a Cedar River system to be paid for by revenue bonds. The new bonds, however, required voter approval. A contemporary characterized the election that followed as "waged with a fury scarcely equaled in any other campaign that the city has experienced." Support for Thomson's plan came from a combination of Progressives and Populists. The opposition was led by eastern capitalist Edward Ammidown, who allied with some prominent Seattle businessmen to incorporate the Seattle Power Company and build a Cedar River system that would sell its water to the city. The well-funded privatizing forces hired bands and speakers and hurled accusations of socialism at the public utility advocates. Federal judge J.J. McGilvra, a Lincoln appointee and respected Seattle civic leader, published a letter in the Post-Intelligencer supporting Ammidon's plan and urging a nay vote on city ownership. This apparent setback set the stage for Thomson's strategy. Pioneer Seattle historian Clarence Bagley noted Thomson's "Masterful fighting" qualities, and the engineer's assistants said he hunted "with a rifle, not a shotgun." Thomson set his sights on McGilvra. After several meetings with the city engineer, the judge ten days before the election wrote a second letter to the P-I calling for approval of the bond issue. McGilvra then paid for the bands and speakers supporting public water. The combination of populism and respectability won the day with 2,656 votes for the measure to 1,665 against. As Thomson's assistant George Cotterill later noted, "what we accomplished here in 1895.within a few years every state did the same. Hundreds of millions of utility bonds were issued, interest rates were lowered, and utility bond investment was among the safest and most desirable." When Thomson and Cotterill emerged from the Cedar River watershed with their completed surveys in 1897, the city was alive with the stimulating effects of the Klondike Gold Rush. The following year the city acquired Landsburg for the site of its supply intake. The timber-crib dam there was constructed on concrete piers set at an elevation of 536.4 feet, a head high enough to carry water by gravity twenty-eight miles to the city reservoirs at Volunteer and Lincoln parks on Capitol Hill. From the headworks the water was delivered a few hundred feet downstream through a 54-inch pipe to a settling basin where the flow passed through screens, initially operated manually, to remove coarser materials like sticks and leaves. Over twenty-two miles of the pipeline were constructed of wood staves bound with threaded steel bands of the latest design. On Christmas Eve, 1990, the system tested so satisfactorily that on January, 10, 1901, the waters of the Cedar River were let loose into the Volunteer Park reservoir. After a decade of riotous development, during which Seattle's population grew from 80,000 in 1900 to nearly 240,000 in 1910, a second pipeline, which paralleled the first, was added in 1909. With the two mains the Cedar system capacity increased to 67,269,000 gallons a day. Two additional city reservoirs with a 110 million gallon combined capacity were also built atop Beacon Hill. In 1928 the Seattle utility began diverting Cedar River water to the 500-acre Lake Youngs (formerly called Swan Lake and named for water Superintendent L. B. Youngs), seven miles west of Landsburg, for settling and storage. The following July Seattleites complained about the taste when the heavy summer draw lowered the lake level and raised its temperature. Eventually, a pipeline was added, which allowed the utility to bypass the lake when the river waters were cool and clear and did not need settling. From Lake Youngs, water was sent through the system control works where it was screened and chlorinated before being delivered to its users. In 1923 the city completed a third Cedar River pipeline that ran parallel to the first two. A fourth line was dedicated in 1954. Its path was entirely separated from the first three lines, in part as a precaution against any disasters that might sever the triad of pipes that ran through Renton and up and along the ridge of Beacon Hill to the city reservoirs. The fourth Cedar River line, or the Bow Lake Pipeline as it was originally called, entered the city from the southwest after running west from the control works to near Bow Lake in the neighborhood of Sea-Tac Airport. Getting water to Alki Point and the rest of West Seattle was still a problem sixty years after most of the first settlers left. West Seattle was annexed in 1907, following proclamations that the two communities were "plainly designated by nature to form one community." However, the Duwamish River, which at the time was being developed into the Duwamish Waterway, inhibited the transport of Cedar River water to the annexed neighborhoods. The swing bridge over the Duwamish, built for wagons and trolleys in 1910, also carried the city's main water lines to West Seattle. The effects on West Seattle plumbing were easily calculated. Whenever the bridge swung open for a boat or barge, the taps of West Seattle went dry. This intermittent service continued until the bridge was scrapped in 1918 and the mains submerged beneath the river's traffic. The underwater solution was improved in 1924 when an 8-foot, concrete-lined tunnel was dug beneath the river and a steel main with walls three inches thick was laid within it. The desire for Cedar River water also figured prominently in Ballard's annexation in 1907. In the "Shingle Capital of the World," the campaign for "pure and sufficient water" was helped considerable when a dead horse was found floating in the Ballard reservoir on the eve of the election. More water had to be crossed in the city's extension of service to neighborhoods on the north shore of Lake Union. A pipeline from the Volunteer Park reservoir was run across the old Latona Bridge, which spanned the lake's narrow neck to Portage Bay in line with the future I-5 Ship Canal Bridge. Beginning in 1911 an extension of Cedar River Pipeline #2 was carried parallel to the Latona bridge on its own timber-pile span until 1916, when nearly 2,000 feet of 42-inch steel pipe were laid through a concrete tunnel built beneath the lake at the same passage. In 1906 the City of Seattle made a widely unpopular decision to allow the Milwaukee Railroad to run its electric line to Snoqualmie Pass twelve miles through the lower Cedar River watershed. Five years later on the Sunday morning of November 19, 1911, the church bells of Renton called not for worship but for flood, sending its citizens scurrying for the hills. A warm Chinook wind released a downpour which swelled the river and undermined the bridge that carried the two Cedar River pipelines just down-stream from the Lansburg intake. The railroad construction along the river was determined partly responsible for making the pipeline's own supports vulnerable. The collapsing bridge broke open both pipes, adding their volume to the already overflowing river and flooding the valley. A water famine in Seattle followed. Citizens were encouraged to fill their bathtubs with lake and rain water and the health commissioner's precaution "BOIL YOUR WATER" blazoned across the front pages of the dailies. Since the limited supply in the city reservoirs were released only to the business district, entire families from more affluent neighborhoods fled their homes for downtown hotels. Schools closed for want of steam heat, and on Wednesday 2,000 bundles of Seattle's dirty laundry were shipped to Tacoma. By week's end water department crews had restored the pipelines. Born of a marriage between science and industry, electric power in the United States initially was the child of big business. Thomas Edison, J.P. Morgan, and George Westinghouse were among the first to realize the financial potential of turning darkness into daylight. In 1885 Henry Villard of Northern Pacific fame declined an offer by his friend Thomas Edison to represent Edison's Electric Light Company in the Northwest. Instead, twenty-three-year-old Sidney Z Mitchell was sent west as the company's exclusive agent. By the following year the former naval cadet had sold the rapidly growing city of Seattle her first electric incandescent lights. With contracts signed for 250 bulbs on a flat monthly basis, Mitchell and his partner, F. H. Sparling, financed Seattle's first electric company, the Seattle Electric Lighting Co., and built a small steam generating station on Jackson Street. It was the first central station system for incandescent electric lighting west of the Rocky Mountains. Unlike the small, isolated systems like that of the Tacoma Mill Company, central systems used one or more large dynamos and produced power for hundreds rather than a dozen bulbs. The Jackson Street station had two steam dynamos and a capacity of 600 lamps. On March 22, 1886, before a delighted group of dignitaries including Mayor Henry Yesler and the city council, the company switched on an exhibition of eleven 16-candlepower lights in their Spartan Seattle headquarters. When the dynamo was started the Seattle P. I. reported "instantly the room was made brilliant with a clear white light." A month later another crowd packed into Toklas and Singerman's San Francisco Store, the company's first customer. Years later a spectator reminisced about how those who witnessed the flood of light from five 2,000-candle power lamps that night "could barely believe their eyes." Not to be outdone by their northern rivals, Tacomans ordered 600 bulbs from Mitchell and Sparling, Mitchell successfully merged four Tacoma electric railway companies into the Tacoma Railway & Power Company. However, by this time the electric lighting industry in Tacoma was dominated by the Tacoma Light and Water Company, incorporated by Northern Pacific officials Charles Wright and General John W. Sprague. In Spokane Falls, Mitchell convinced local businessmen to invest in 1,200 bulbs and form the Spokane Falls Water Power Company. The Spokane investors agreed to use only Edison-patented equipment and to pay the Edison Company 30 percent of revenues as royalties. A generator, installed in a plant as the falls in a bay near the end of the Post Street bridge, supplied enough power to extend arc lighting across the bridge up to Main Avenue and east to Howard Street. It even lit Spokane's first opera performance. Within a year the output of the little Spokane Falls plant was insufficient. In 1888 Mitchell supervised the installation of a new plant that had four times the capacity of the old one. The boost in power enabled the company to offer twenty-four-hour service, extend lines to residences for the first time, and to power the first electric motors, including some for the presses of the Spokane Chronicle. But when the company failed to secure the eastern capital needed to expand its facilities, the Edison-affiliate succumbed to the Washington Water Power Company, organized by local businessmen in 1889. Edison and his investors were convinced that water power had no future, but the Spokane entrepreneurs gazed knowingly at the spray of the lower falls and dared the opposite. The eastern steam technology and Edison-patented equipment were not indispensable, they believed, in a town built around and named after a powerful river falls. An article in Electrical World the next year revealed the debt Spokane Falls owed to the development of its hydroelectric power: "The remarkable electrical developments in the far west are nowhere more strikingly exhibited than at Spokane Falls. The rapid and phenomenal growth of this city finds its parallel in the growth of its electrical industries, and this is undoubtedly due in great measure to the magnificent water power that the city posseses." Washington Water Power and president Rockwood Moore was a Spokaneboomer-president of the First National Bank and of the lucky Last Chance Mine, organizer of two electric street railways, and one of the most extensive property owners in town. Moore and the company's other Spokane investors had good reason to be optimistic about their venture. Even after a fire wiped out the thirty-two-block business district in august 1889, the city of nearly 20,000 began rebuilding immediately and kept on growing. The demand for power increased so quickly that the company could not install new dynamos fast enough. By the early 1890s a half-dozen railroads and several electric streetcar systems ran their tracks through Spokane. The biggest of the railroads, the Northern Pacific, ran an aggressive Midwestern campaign touting the great agricultural potential of its land-grant tracts in eastern Washington. When nature cooperated in this promotion with above average rainfall from 1893-97, the railroad was rewarded with trainloads of immigrating families. That Spokane had developed into the "Heart of the Inland Empire" was precipitated by its railroads, but predisposed by its falls. The electric company's decision to situate a large central station at the lowest falls on the south side of the river, "Where the stations could be enlarged to meet the demands of a city of 100,000 people," was propitious. The original Monroe Street dam and the power project began operation in November 1890. Its six Edison generators produced DC current with a capacity of 890 kw, of which a littler over one-third was used to operate the streetcar system. IN 1892 the station was expanded to 1,439 kw, of which a little over one-third was used to operate the streetcar system. In 1892 the station was expanded to 1,439 kw, which included a 60-kw AC generator. Eleven years later the facility was rebuild and some of the DC works were replaced with AC equipment. Two of the 1903 generators, which are still in use, are to be the oldest operating electrical equipment in the state. Washington Water Power grew slowly in its first four years and then nearly went under when the financial panic of 1893 swept the nation. But by the turn of the century the company had recovered and during the next thirty years it bought out approximately eighty-five existing small-town systems and brought first-time service to twenty-eight communities. A second and third hydroelectric project, Post Falls and Little Falls both on the Spokane River, were completed by 1920, by which time Spokane number 104,400 residents. The Long Lake plant and dam, which went into operation in 1915, was the company's largest and most difficult undertaking to date. At the time it was completed, the project boasted the world's largest turbines and the highest spillway at 170 feet. In 1962, after the completion of several more hydroelectric projects on rivers in Washington, Idaho, and Montana, Washington Water Power was one of the few investor-owned utilities in the nation that generated all of its electrical power through the use of falling water. By 1890 Sidney Mitchell had organized incandescent lighting companies in Seattle, Tacoma, Spokane, Ellensburg, Bellingham, Colfax, and other towns and cities throughout the region. When the Panic of 1893 short-circuited Mitchell's plans for a Northwest electric empire, he resorted to the advice and aid of Stone and Webster of Boston, M.I.T. whizkids and the country's most prominent electric power consulting firm. Following their directions Mitchell and his partners managed to consolidate practically all of the power, light, and railway companies operating in Seattle in the late 1890s into the Seattle Electric Company. In 1912 Stone and Webster combined the Seattle company with four other Washington traction and power companies and incorporated under Massachusetts law as the Puget Sound Traction, Light and Power Company. As part of the merger the company acquired three major hydroelectric plants: Snoqualmie Falls, completed in 1898; White River, harnessed in 1911 to meet the demands of electric transportation companies linking Tacoma, Seattle, Everett, Bellingham, and Mount Vernon; and the 20k00-kw Electron plant on the Puyallup River in the foothills of Mount Rainier. The company also obtained the 15,000-kw steam plant built by Stone and Webster in Georgetown in 1906, the Nooksacks Falls plant on the river of the same name, the York Street steam plant in Bellingham, the Seattle power distribution system, and gas properties in Bellingham and coal mines in Renton. At the Georgetown plant two 35-foot-high steam turbines, powered by coal and supplying a total of 11,000 kw, reduced operating costs and increased transmission distance to make power available to Georgetown and south Seattle homes. The company's interconnection of its power facilities with a 55,000-volt, 300-mile-long transmission line was an important step in the evolution of commercial power generation in the state. It was the first time an attempt had been made to link and unify the many individual systems, and it introduced electric service on a territorial basis in the Puget Sound region. Patterned after Niagara Falls and housed in a great cavern hollowed out of rock nearly 300 feet underground, the Snoqualmie Falls power project was the state's first large hydroelectric plant. The Snoqualmie Falls Project was certainly the most visually spectacular of the Stone and Webster acquisitions. One hundred feet higher than Niagara, the falls had for years inspired the reverence of the Indians and the awe of the first settlers and eventually t he first tourists. When it was completed in 1898, the plant contained the works to generate 6,000 kw, 200 times the maximum output of the original Spokane Falls plant. Five hundred feet back from the crest of the falls, a low dam diverts water into a vertical shaft excavated out of solid rock. Here the water drops 270 feet before the shaft turns an abrupt 90 degree angle and expands into a larger chamber at the level of the river below the falls. In the horizontal chamber penstocks discharge water through four water wheels before it escapes through a 400-foot-long tunnel to the foot of the falls. The Snoqualmie Falls plant was an engineering wonder, and even more remarkable, was completed in less than a year's time. Almost one hundred years after start-up the original generators are still producing. When it was completed in 1904, the 20,000-horse power system at Electron on the Puyallup River generated more power than any other facility in the state. This distinction did not last long, but the Electron project remained significant as an example of the state-of-the-art of high-head power development and of the changes that occurred in hydroelectric technology as it moved west across the country. Most of pioneering hydroelectric experimentation and development was based on the natural condition s that prevailed in the East. The typical eastern plant operated under a high volume and a low head, or short fall, of water. The type of generating equipment used for low-head installations could not be adapted for high-head or long fall conditions. Consequently, a new design technology emerged for the vast high-head water resources of the West Coast. An important innovation appeared in the 1880s, derived from the timber hurdy-gurdy wheel developed by California gold miners two decades earlier. It was the tangential impulse of Pelton wheel. In contrast to the old-style undershot and overshot water wheels, and the reaction or mixed-flow Francis turbines used in the East, the Pelton wheel used twin buckets with curved bottoms, inclined sides, and a raised center ridge which divided the incoming jet of water. This design permitted minimal interference between incoming and outgoing water and doubled the efficiency of the wheel. By 1900 the tangential impulse wheel had become the characteristic water turbine in high-head hydroelectric projects. The Electron water wheels at the time of their installation were claimed to be the largest impulse units in the world. Another characteristic and indispensable feature in the evolution of high-head water power was the extensive water network that conveyed water to the turbines. The ten-mil0lone timber flume at Electron is still the longest flume used for power production in the state. The technology for building concrete flumes existed when the project was under construction, but because of the high costs involved, especially for transportation in the mountainous region, the Stone and Webster engineers decided to use the abundant timber available nearby. However, the untreated timber had a life span of only twelve to fifteen years and required frequent and costly maintenance. To facilitate inspection and upkeep, a standard-gauge train track was laid on top of the structure. The rail line, which could not be run alongside the flume because of the steep terrain, became known to locals as "the world's crookedest railroad." Approximately ten miles from the Mount Rainier glaciers which feed the river, a low timber crib dam across the Puyallup River diverts water into the flume. Built with pick and shovel on a uniform grade of 7.5 feet per mile, the flume carries the water across the rugged terrain into the reservoir on a plateau, 900 feet above the powerhouse. Penstocks, tubes through which the failing water is funneled toward the turbine blades, then carry the water down a 30 degree incline to the powerhouse. Here the water operates four twin Pelton Impulse turbines under a head of 872 feet. The Electron project was built by the Columbia Improvement Company, formed by Stone and Webster and managed by none other than Sidney Mitchell, Samuel L. Shuffleton, a renowned construction engineer who managed all of Stone and Webster's operation west of the Mississippi, made the initial surveys and design studies. After it came on line, Electron supplied most of the power for Seattle's commercial, residential, and street lighting until Seattle City Light increasingly took over these services. It also boosted the power load of the expanding interurban electric railway system in Tacoma and Seattle and furnished power to a number of industries and small communities between the two cities. By 1910 the plants at Snoqualmie Falls and Electron could not keep up with the ever-increasing load demand of the Puget Sound population. Fluctuations in river flow were greater than had been anticipated, and neither installation had adequate storage facilities to provide reliable uninterrupted current. Dependable service was restored in 1911 with the coming on line of the White River installation at Dieringer, between Auburn and Sumner. Water was diverted from the White River near Buckley and flowed through a series of flumes and canals to an immense storage reservoir at Lake Tapps. Enough water was impounded there to operate the plant at full load, 20,000kw, for and entire month. The early history of Seattle City Light is wound about a generator named James Delmage Ross. "Jay Dee" was hired in 1902 to wire the public utility's first installation, the hydroelectric plant on the Cedar River, and he was with the utility for the next thirty-seven years. Ross grew up with electricity, and his engineering was largely self-taught. When the Seattle Electric Lighting Company first brightened Seattle streets in 1886, Ross was still in his early teens and living with his parents in Chatham, Ontario where he conducted electrical experiments powered by self-made batteries. 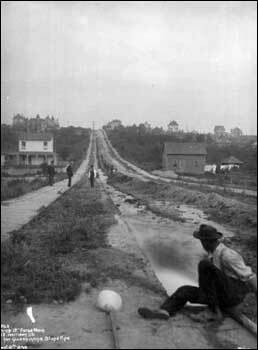 In Seattle, as elsewhere, the first electric service was balkanized, a patchwork of small steam generators feeding expensive and unreliable power to small territories in this 1893 report to the city council, the Seattle Board of Public Works complained that "The difficulty of keeping an accurate check on which street lights are burning.and the impossibility of the city knowing whether the full candlepower of a light is being furnished or not.lead the board to believe that sound business judgment demands that the city own its own electric light plant." When the city composed its new charter in 1896, this explicitly empowered itself to provide for the lighting of streets, public buildings and residences and own whatever power facilities might be required. Seattle's physical opportunity for public power came along with its new waterworks on the Cedar River. One year after the river's waters were first released into city reservoirs, city engineer R. H. Thomson recommended a dam site on the Cedar about a half-mile below Cedar (Chester Morse) lake. When Seattle voters agreed in 1902 to support Thomson's proposal to exploit the Cedar River for municipal power as well as water, they were partly demonstrating their distrust of the Seattle Electric Co. (the future Puget Sound Power and Light), which was owned by eastern capitalists and had established a near monopoly on electric power and the streetcar service. During that and the following year, middle-and working-class Populists and Democrats managed to convince a majority of Seattle citizens that their best interest would be served by municipal control of "natural" monopolies. In the 1902 and 1903 elections voters approved the creation and financing of Seattle City Light. 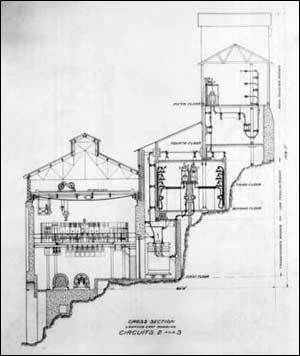 What distinguished the city's plant at Cedar Falls was not its technology, but rather its status as the first publicly built hydroelectric installation in the country. The dam was of timber-crib, rock-filled design, and constructed entirely of lumber logged and milled at the site. About three miles below the dam, the power-house was connected to it by a four-foot wood stave pipeline. The current traveled forty miles to the utility's first distribution station at Seventh Avenue and Yesler Way. It was transmitted at 45,000 volts, which was a record level at the time. Even so, the plant capacity was made rapidly inadequate by Seattle's alarming growth. In 1909 two additional generators raised it from 2,400 kilowatts to its limit: 10,400 kw. In the following year the candlepower of the city street lights rose 600 percent, making it necessary to build a second generating plant that was also hydroelectric, although an oddity. The 1,500-kw auxiliary hydro unit used the overflow from the water department's Volunteer Park Reservoir. Installed in 1911 at an elevation of about 300 feet below the reservoir, it was built at a site that was developed into the department's Lake Union steam plant. Steam units were added there in 1914, 1918 and 1921. The city's burgeoning appetite for electricity was due in part to the department's campaign, begun in 1912, to sell electric appliances, free wiring included. The new department also worked to improve its stock at Cedar River. 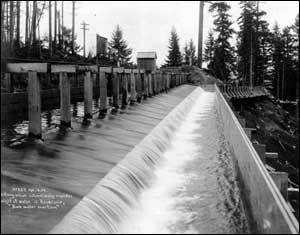 In 1914 a new 215-foot-high masonry dam was completed about midway between the original timber dam and its powerhouse. From the beginning the reservoir behind the new dam was plagued with seepage, making it practically useless as a reservoir for generating power. Observers feared that the bank might slip away, releasing a flood that could suddenly engulf not only the generating plant at Cedar Falls but also the water department's at Landsburg. The steam generators at Lake Union made up the shortfalls in kilowatts until City Light could stop these leaks and develop a new site on the Skagit River. The canyon on the Skagit was made of stiffer stuff than the percolating glacial till beside the Cedar River. Superintendent Ross was fond of reciting the "glories of the Skagit.lying entirely in hard granite." The Skagit site was not, however, his first pick. Ross firs cast his eyes towards Lake Cushman on the Olympic Peninsula. While Seattle voters approved condemnation and purchase of the Lake Cushman site in 1914, they did not tally the required 60 percent majority to bond the actual construction of the faciltiy. Later it was lost to Tacoma. When the department went searching elsewhere, on the Skykomish and White rivers, they were foiled by Puget Sound Power and Light, which quickly bought the sites before the city could act. The private company's mole-like talent for uncovering what Ross was up to may have even reached into his bedroom where his wife, Alice, dislodged a microphone from the chimney while burning trash in the fireplace. Ross returned the stealth in 1917. 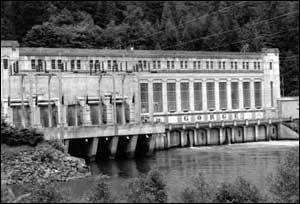 Puget power had the first rights to develop the Skagit River for power, but as Ross discovered, they had lapsed temporarily. Using his own and borrowed cash, Ross rushed his own application - in his name - to Washington, D.C., where the Department of Agriculture held authority over power sites on federal land. Ross told the federal officials that Puget power grabbed the White and Skykomish river sites while still holding but not developing the Skagit. He characterized the company's greed as an instance "of the boy in Aesop's fable who put his hand in the jar of nuts and grabbed them all but could not get his hand out without dropping everything." Ultimately, it was David Houston, the Secretary of Agriculture, who had to choose between the city and the company. His decision in Ross's favor arrived on December 25, 1918, just hours after Ross learned of the "Boxley Blowout." A large portion of the leaking reservoir on the Cedar River had suddenly washed away, destroying sawmills, railroad tracks, and the entire town of Edgewick to the north. Fortunately for Seattle's light and water plants on the Cedar, the flood ultimately drained into the Snoqualmie River basin. By the time the reservoir was at last made relatively safe and impervious, the Skagit's first two dams, Gorge and Diablo were completed.